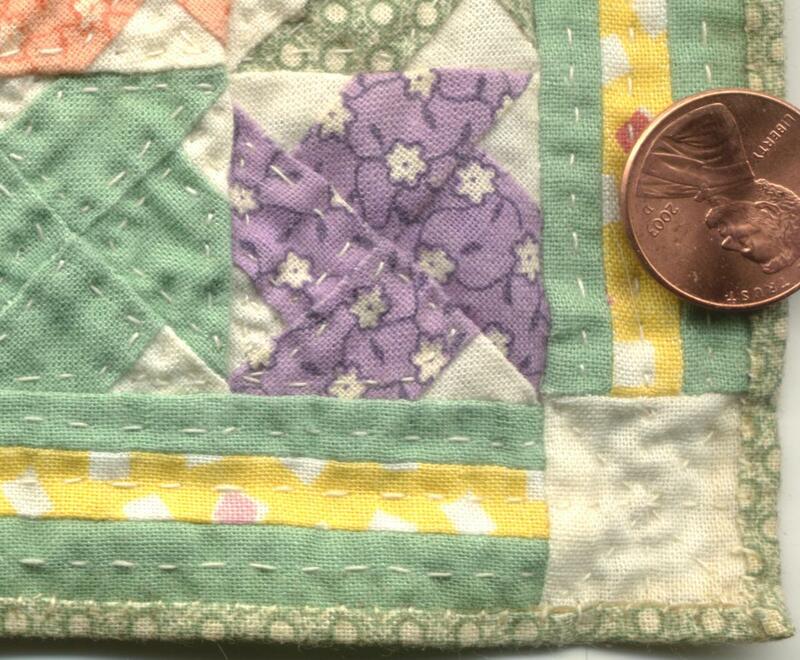 Miniature Quilt: how small can you go with your blocks? Something that I have been busy with over the last few months is a Granny flower quilt, it is made up of lots of individual hexagons. My hexagons are 1/4", it isn't finished yet, I am just over halfway with it now. A few years ago when I was still new to the hobby I made the Trip around the world quilt with finished squares of 5/8", if I ever make one again I will definitely make it with smaller squares. So what is the smallest you have tried to go on a quilting piece? Elga, those are beautiful quilts! I have an unfinished hexagon quilt with 3/16" side for the hex, the widest point side to side is 3/8". The piecing the quilt was easy, the quilting, not much fun. I'll hold off posting a picture until it is quilted because my stitches to hold the fabric around the hex haven't been removed until I finish it. Someday.... when we all have a lot of time on our hands, I would love to participate in a worldwide friendship quilt block exchange. Beautiful quilt. Even for a guy I know quite a bit about the kind of work that goes into these, at least full size. 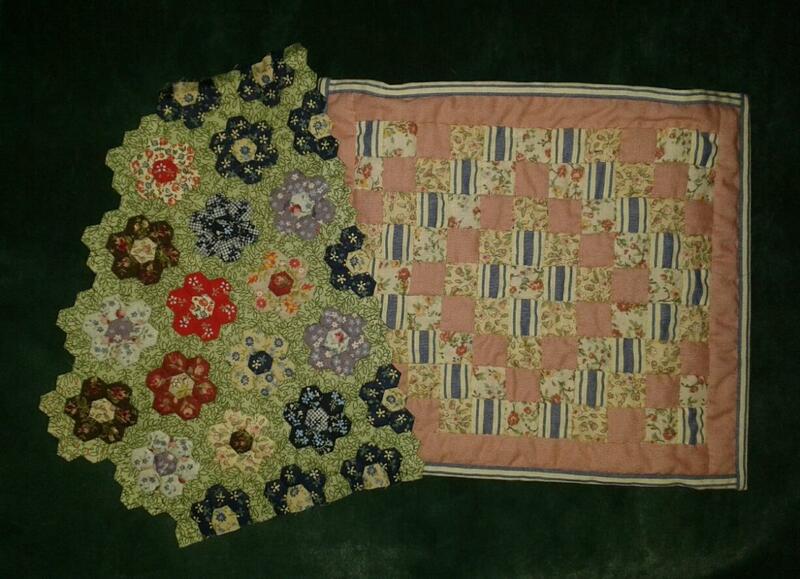 Both my Grand mother and Great Grandmother on moms side were quilters and as a child I remember sitting playing with buttons under their quilting frame which Great Grandpa made. Also when I became an adult, if that ever really happened yet I was given a "hope chest" filled with quilts made for me..... See grandma took turns making quilts for each grand child and by the time she passed we each had at least a half dozen. Now my brother used to take his to the beach as beach blankets, he even got scolded once by a woman walking by about being so disrespectful of the work involved in making that and here he was throwing it out on the sand. Anyway both brother and sister pretty well used theirs up, me I would and still do use things way past their time, like wearing thread bare shirts and pants with holes in the knees. So I still have some unused, 50 plus year old quilts put away.... They still even have Grandmas pencil lines where she drew her patterns for hand quilting. She did use a machine for putting the squares together. I don't keep a quilt on the bed much these days but sometimes I pull out a really pretty one for a while......... And since I never had kids the blue and pink baby quilts have often been used as lap blankets while watching TV on the sofa. Tamra, I am looking forward to seeing your finished quilt, are you quilting each hexagon? I thought of doing the outside of each flower. Bill, I think I would also be tempted to scold somebody throwing a quilt on the beach. There are some people who make miniature quilts by machine, I just think it is easier to control these small pieces of fabric by hand and more relaxing I think. My one grandma and her sisters did a lot of crochet and embroidery and I still use some of their pieces around the house, so many hours of labour went into them that they sure are heirlooms now, sounds like you had a lot of special women in your family. Beautiful start on the quilt Elga. Hope to see out finished one day. 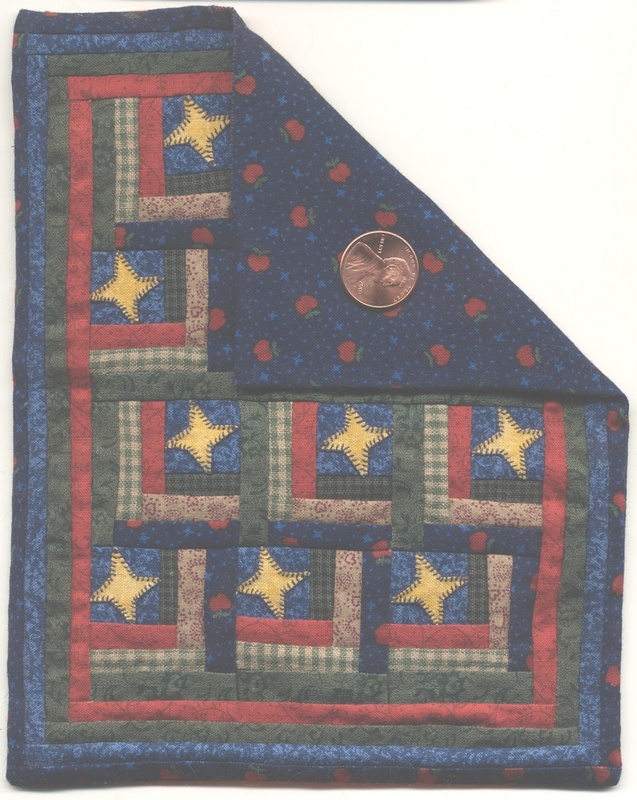 Growing up, quilts were an every day thing in our family. There usually was a frame in our house of an aunts house. 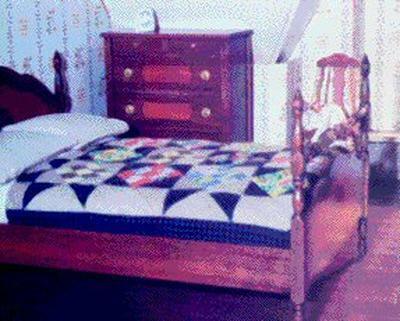 Most of the quilts were utilitarian and fairly plain. They were like every day clothing and they usually wore out over a few years. Some times they were patched if possible or cut apart and reused in another quilt. There were no special attachment to them. We used them for ground cover during picnics, My dad spread them over the hood of the car during cold weather. Quilts then were meant to be used. In the 1930s and 40s most sugar and flour came in cloth bags. Many came with embroidery stencils on them. I learned to embroidery on sugar sacks. My aunt kept them and made me a quilt from them for my tenth birthday. Unfortunately a couple years later we had a flash flood which ruined my blanket. So using a quilt on the beach would not be unusual. My wife still has two blankets from her grandmothers but doesn't use them; keeps them in her hope chest. 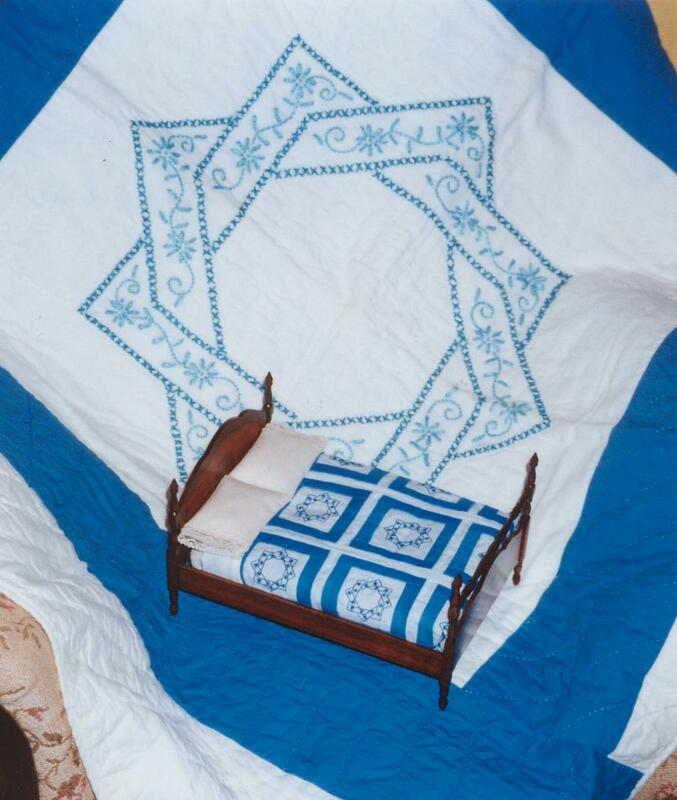 Your quilts are lovely, Elga, and I've seen pictures of Tamra's beautiful tiny blocks, too. I also grew up with quilts for everyday use. As they became worn, my mother used them for mattress pads, and they were wrapped around furniture when we moved. My grandmother made quilts to help support the family in the 30's. She combed out her batts from cotton my grandfather grew in south Texas, and her frame was on pulleys over the kitchen table. I treasure my baby quilt made with one inch blocks. My mother had a quilt top with the names and birthdays of all her siblings and half-siblings embroidered on twenty (yes, 20) blocks. It had been hand-pieced, and she quilted it on a machine. One night after she learned to love hand quilting, several of the family helped her pick out all the machine stitching so she could do it over by hand. I think a miniature friendship quilt would be wonderful to do, Tamra. I think there was a class one year in Castine that did that and shared blocks. Sue, yes definitely I want to quilt each hex, just inside of the seam. Then, I'm going to get it wet, and let it air dry and hopefully will get that 'quilted' look that I want in miniature. I showed the quilt to Tracy Balanski (Angel's Rest Creations, IGMA Artisan) when I was at the Chicago show 2014, and she gave me some great tips. Miniaturists are such generous and nice people! 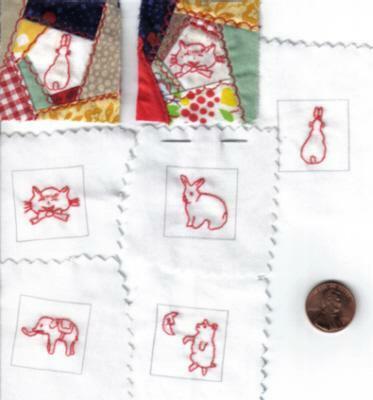 I did all my piecing by hand for miniature quilts that I have in progress, for me it was easier to control, and get the points to match. Because of the GS class for the Friendship quilt, I think that was 2006 with Kate Adams, I did purchase Singer Featherweight last year. I haven't tried to do any piecing yet with the machine. I do think to do an international exchange with our miniature friends we would have to do them by machine. I'm really trying to NOT start another quilt until I finish this one. I have considered making the hex smaller again, it is still a little large, and I'm working through some ideas I have running around in my brain to make working a smaller hex a possibility... but it is all still running in my head. The size of the hexes really are not that critical. Don't forget, RL quilts are made from anywhere of 1/4 inch up to at least 3 inch hexes, so in comparison, it is really irrelevant how small you can make them. if you check out this RL quilt http://gumvalleypatchwork.typepad.com/my_weblog/my-dear-prudence-hexagon-quilt.html it is made from 1/4 inch hexes. it would be impossible to copy that quilt in 1/12 scale!!! But really 1/4 inch hexes would be the equivalent of 3 inch hexes, and there are lots of quilts out there in that size. Tamra, I was wondering about quilting your tiny hexes, but I never said so. Were you reading my mind? I made these quilts when I first started in miniatures, around 15 years ago. These are old pictures, and some of the quilts now belong to someone else, so I can't take more pictures. The hexagon/diamond quilt is just barely started, and I think the diamond is the smallest piece I've done, 1/4" X 3/8" finished. Some of the quilts are machine pieced, and some are hand pieced. The ones that are quilted are hand quilted. Your quilts are beautiful Missy! 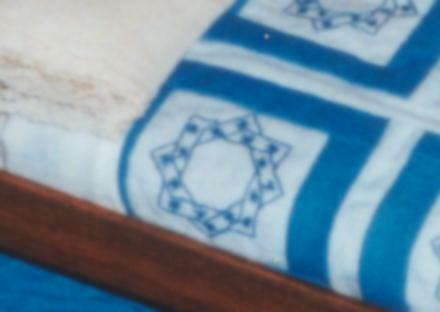 I love the blue and white one, did you embroider the white blocks with blue thread or is the design printed on? Thanks Elga. The blue blocks are embroidered. The full size block it's pictured with is one of a few blocks that remain from my grandmother's full size quilt. I made the miniature for my mother's dollhouse. Sue in Mesa, no I wasn't reading your mind; it is just that all of us fiber workers minds work the same way! It was Elga that asked if I was going to quilt each hex. 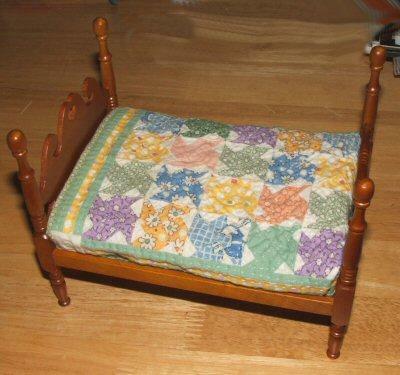 Missy, your quilts are beautiful; I can imagine that your Mom is very proud of your miniature. I really love quilts! Elga, your quilts are beautiful. I made 2 a couple of years ago. A Granny flower quilt and it looks like my hexes are about the same size as yours. The hexes I used came from Cheryl Kerfoot. I have seen Tamra's quilt. She is doing a lovely job and look forward to seeing the progress she has made since last spring. Her hexes are a little smaller than mine. I do want to do another one with smaller hexes. My other quilt is 1/2" squares. I think the pattern was Around the World. I wish my squares were a little smaller too. Maybe 3/8". However I was happy with the results of both. They reside on the walls in my quilt shop. One of these days, I'd like to add more quilts to my shop. Carolyn, welcome to the forum, wonderful to have you here. My hexes came from Cheryl too...and I remember your quilt, looked at your photo on Petitpointers just the other day, I was wondering how you finished your edges. Elga, amazing work as usual. Missy, that blue square is striking, as is your adaptation! embroidered on the back side. She also made one for my sister. I can't believe how well they have held up; we still use them occasionally. I used the English Paper Piecing method, and basted the fabric to the hexagons, and then whip stitched each piece. I think there are 541 hexagons in this quilt. I used the stabbing method for quilting. This was hand quilted with size 100 YLI Silk Sewing thread... and standard fabric with very small prints... This is my first miniature quilt, so the decisions for what to use for batting and deciding on a needleturned edge vs. appliqued edge that was straight were part of the delays to the process of finishing. In the next couple of weeks, I still need to make the top sheet, which will require another session of needleturning for the edges of the sheet. Bed is by Clare Bell, and the pillows are 100% down... although I think while they are wonderfully soft, they are still kinda puffy, so two options come to mind, to take some of the down out, or perhaps add a set of bead or sand pillows in the future for additional realism. I have also included a photo of the Standard miniature hexagon quilt that was taught at many NAME Conventions, (that size is available at your local brick and mortar quilt store) vs. my reduced hexagon. I still want to reduce my hexagons again to see if I can make it smaller and manage piecing it....perhaps as a trip around the world kinda piece but instead of 1/4" squares I would use hexagons. That's gorgeous, Tamra! I don't think the pillows are too puffy at all, but a selection of different sizes and shapes would certainly be comfy looking. I'm picturing down all over the place while you were stuffing them. You could make a great pillow fight scene. Over the years I've been thinking about the size of the blocks, and I think the thread count of the fabric is what determines that more than anything else. I have some extremely fine weave batiste, around 100 ct if I remember right, and I'd love to try dying it or printing on it and using it for quilting some day - when I have time. Ha! I'd like to try using the finest pipers silk to piece the blocks which would decrease the bulkiness and size of the seams. Your quilt looks fantastic Tamra! And I also think the pillows looks just right to snuggle your head in.